Colorado - we can help you! New Mexico - we can help you too! California - we're there for you! 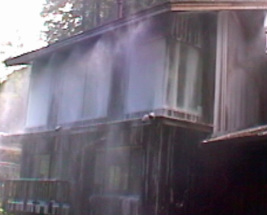 Spraying firefighting foam in Big Sur, CA. Now you can help to protect your home, estate, or ranch from wildfire using the next generation of wildfire protection. No longer do you have to wait for the fire trucks to arrive. You can have your very own wildfire protection system installed to protect your property 24/7. You will have Peace of Mind knowing you're protected with a wildfire protection system. We can help you pick the best system for your individual situation or budget. We carry water based protection systems and foam based wildfire protection systems. You can use your pool, pond, or other water reservoir, or we can install stored water above or below ground for you. We can provide you with an entire system for you to install or we can install a wildfire protection system for you. Whether you have a small parcel of land or many acres, we can help you protect any size property. You may have a landscaped lot or acres of grassland, forest land, or heavy sage brush and oaks. We offer our signature product called the FOAMSAFE™ System, which is the best wildfire protection system on the market today for both protecting your property with pretreatment, or suppressing an ongoing fire. You can also put out a fire inside of your house with the “patent pending” FOAMSAFE system. FOAMSAFE Systems are completely self-contained with their own power and water. Upon activation, your property will be automatically blanketed with a safe, biodegradable foam to help protect it from wildfire; the same firefighting foam used and approved by the US Forest Service and rated safe for plants, animals, and humans by the Environmental Protection Agency. Depending on your location, there may be a seasonal or year-round wildfire threat where you reside. Using a FOAMSAFE system to protect your home and property gives you peace of mind and the best chance of fighting the wildfire, whether your there or not. Property Owners – No longer will you have to wait anxiously, filled with fear, when you hear there is a wildfire in your community.You won’t have to worry about whether the firefighters will be there to defend your home and all your cherished belongings, nor will you sit at an evacuation site with visions of your home and possessions burning to the ground. Knowing you have the FOAMSAFE FireMaster Series system installed on your property will give you peace of mind. This system can even call you to tell you it has activated and report to you it’s status as it helps to protect your home. See the FOAMSAFE FireMaster Series page for details. FOAMSAFE FireMaster Series – permanently installed on any size property for protection of both structures and vegetation. Can be operated manually or automatically using computerized technology of the 21st century. Learn more about it HERE. FOAMSAFE Portable Systems - recommended for "foam on the go" for properties such as ranches, and large properties where sources are needed in many places. Fire agencies can use this system to protect a group of homes or structures, or to pretreat them without personell present.recommended for lease for the fire season or purchase for portable applications. Available in slip on, truck mounted, or other options. FOAMSAFE Fire Alert System – recommended for applications where fire alarm only is to be used. System will notify up to 4 contacts when activated and sound audible alarm. These FOAMSAFE Products have been designed and developed by firefighters, fire protection designers, fire inspectors, top level fire officials and foam specialists. In addition, our experienced sales staff will see to it that you get the best service possible before, during, and after your system is purchased and installed. Click on the Product name to see how to choose the best option for you. You may also want to call and speak with a specialist at 1-866-901-CFPI (2374) to see how we can help you protect your property and valuables from wildfire. All FOAMSAFE Fire Protection Systems are built and installed per National Fire Protection Association (NFPA) standards. Rigorous testing takes place prior to every system leaving our manufacturing facility. We follow the International Fire Code (IFC) and International Building Codes (IBC) and American Society of Mechanical Engineers (ASME) standards are also met where possible. Our installation team is qualified with the required license and permits to install your system. We have International Code Council (ICC) Fire Inspectors on staff to oversee the design and installation of your system. Following the installation of your FOAMSAFE system, scheduled maintenance will ensure your system will be ready to activate when you need it the most. At Consumer Fire Products, Inc, our #1 priority is reliability. You can depend on your FOAMSAFE System to be there for you whether you’re there or not. Using our patent pending technology, this FOAMSAFE system will detect a fire from up to 1/2 mile away and automatically activate spraying a firefighting foam used by your local fire department in an effort to protect your property from being destroyed by wildfire.